At Capitol, our Health cardiologists diagnose, treat and manage common and rare heart conditions including the following. So, now forth people of the region don’t have go far to avail quality heart services, it is right here next to you with the best Cardiology services in the region and treatment with a team of competitive doctors. 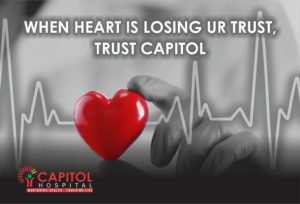 Cardiac sciences department at Capitol Hospital, Jalandhar is fully equipped with the latest and the most advanced technology to deliver the best treatment coupled with expertise from a team of doctors. With the advanced team of highly professional and dedicated and an adept team of cardiac surgeons, we have successfully performed some of the most challenging surgeries like complex aortic and arch surgeries. Our focus remains heart healthy patients, this is the reason we conduct regular awareness camps and educate the patients to maintain a healthy heart and monitor their heart health. It is our promise to you that we restore your heart health in the best manner possible, the very moment you rest your heart into our hands.